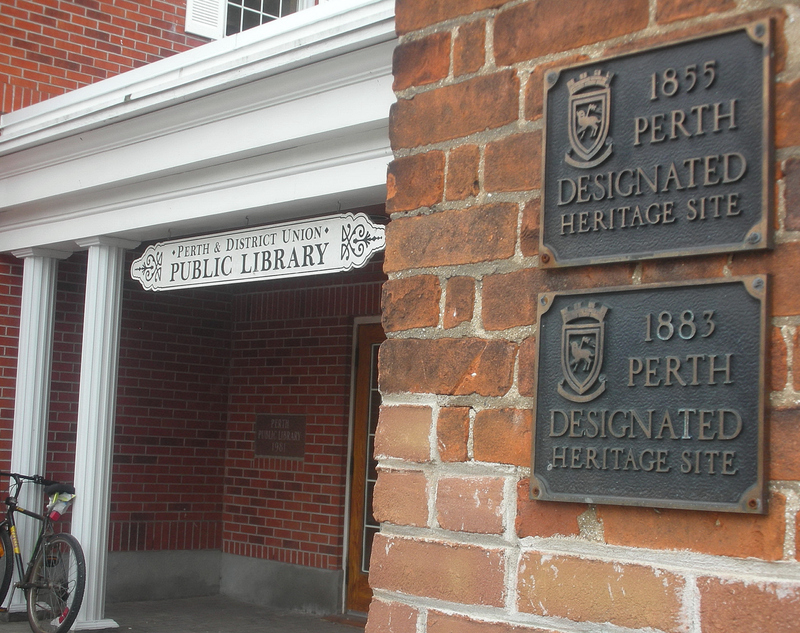 Along the shores of the picturesque Tay River, in the historic town of Perth, Ontario, the Perth and District Union Public Library was a lovely setting for an early December book signing. 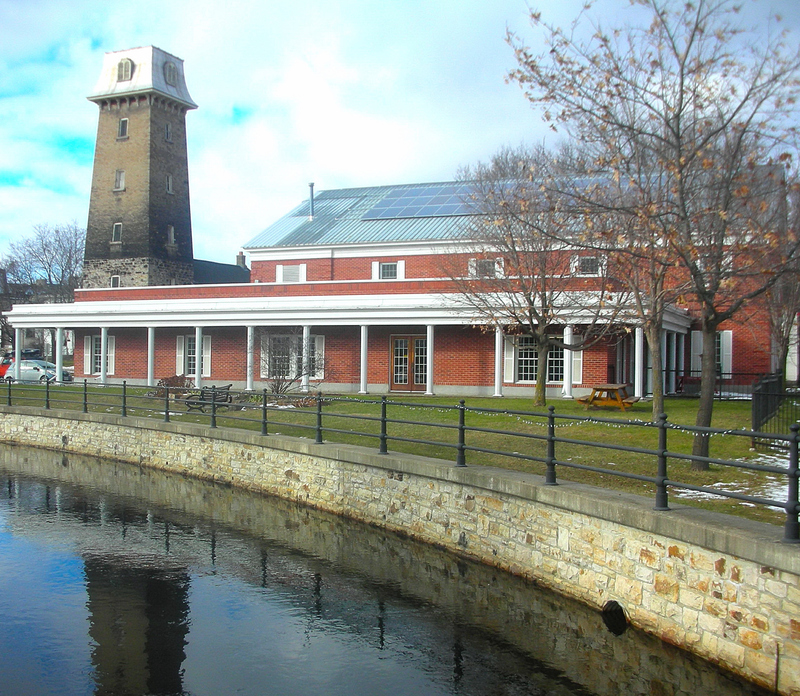 As you can see from the photos, it has been a mild winter so far in the Perth area, and there is very little snow compared to years gone by, in this particular region of Eastern Ontario. We would like to thank Marina Ramsden of the Perth Library for her warm welcome and hospitality and for hosting the event. 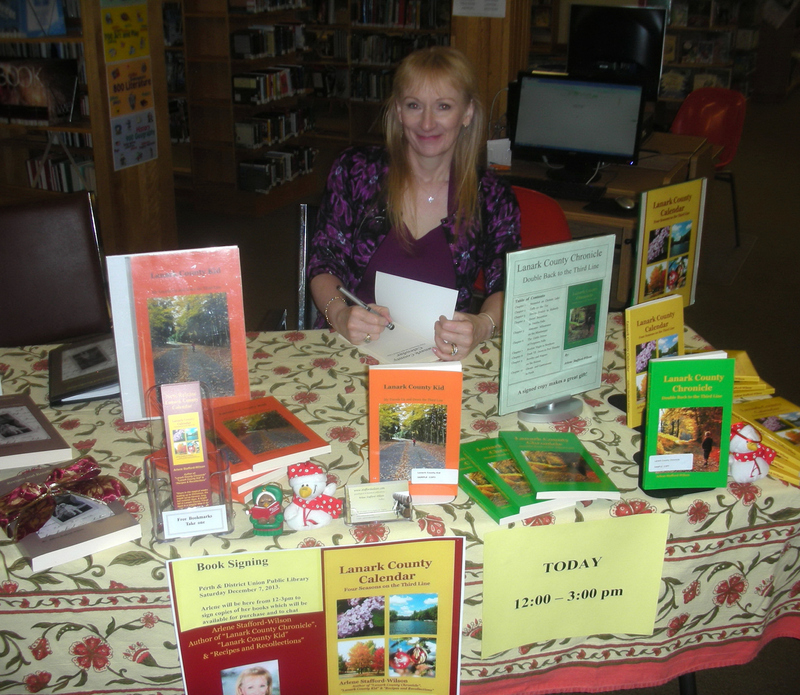 Marina had set up a large table complete with a festive table cloth and cheery seasonal plant for the book signing and throughout the afternoon a steady stream of folks young and old stopped by to say hello and chat about the books. We were delighted to have a special visitor Heather Kitching. Heather, who hails from British Columbia, is currently working on an historical documentary project with Carleton University in Ottawa. Her research team is producing a film involving Ottawa Valley history from the perspective of the old timber camp songs. One of the stories in the documentary will feature the tale of James Phelan, son of an early pioneer settler, who drowned in a raft accident, while breaking a log jam on the Mississippi River in 1878. The Phelan family was among the earliest settlers to Drummond Township and their ancestral farm was located directly across the Mississippi River from the Stafford family homestead. Being one of the Irish Catholic immigrant families they attended St. Patrick’s near Ferguson Falls and the graves of some of the early Phelan family members still stand today as a tribute to this early family. In conclusion, our day at the Perth Library was really enjoyable. 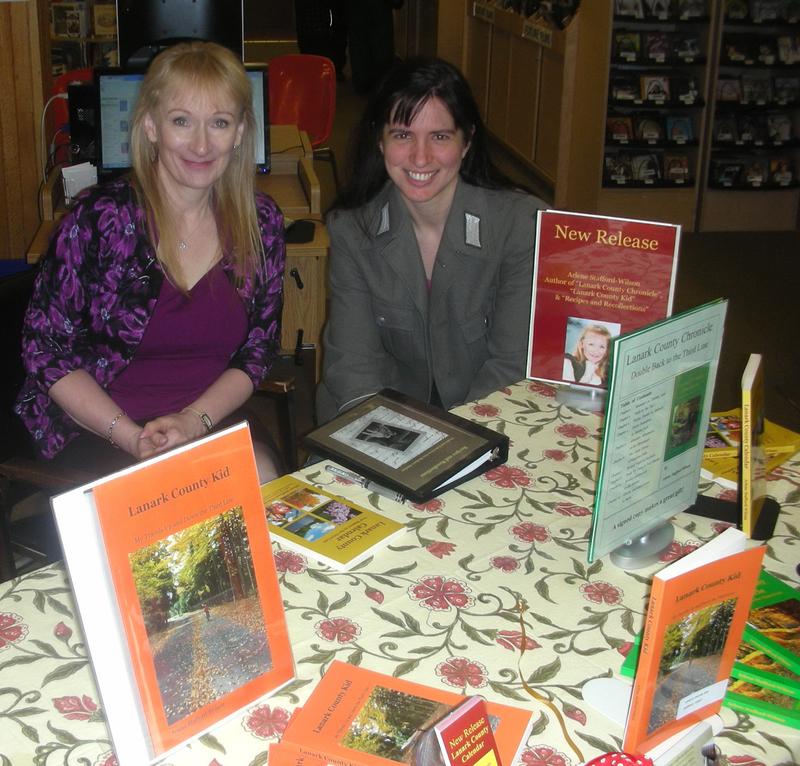 Marina was a gracious host and we met some new folks and chatted with some people who had read previous books like ‘Lanark County Kid’ and ‘Lanark County Chronicle’. It’s always nice to be back in Perth, and even better still to be there on such a mild, sunny December day. 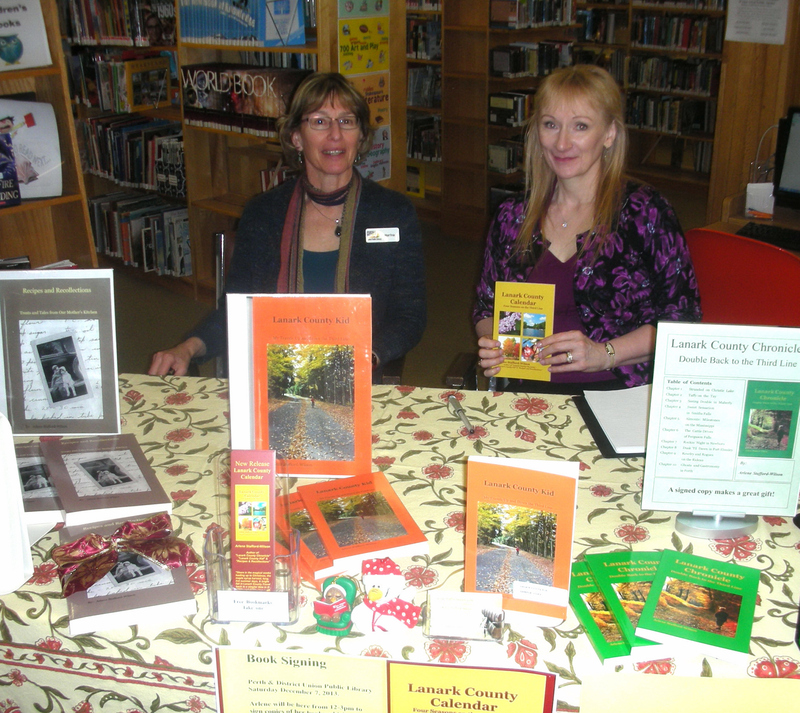 This entry was posted in Author Events & Book Signings and tagged Arlene Stafford-Wilson, Lanark County genealogy, Perth and District Union Public Library, Perth public library, Phelan Drummond Township, Phelan family history, Phelan genealogy, Phelan Lanark County.